In a city sacrificed on the altar of real estate speculation, building over a waterway turned out to be the cheapest and fastest way to solve chronic traffic congestion, but the costliest in terms of environmental and urban impacts. Seoul's projects being on hold for the "U Smartway" underground expressways as well as for new subway lines in the area, we might have to wait for decades before the Cheonggyecheon scenario is reproduced here. And that's a shame, because Hongjecheon is dotted with absolutely charming sites. But to enjoy them, you have to use your imagination, and to mentally photoshop all this concrete out of your sight. Here, the young streamlet has been almost completely obliterated, and only short segments emerge on both sides of Segeomjeong-ro, Pyeongchang-dong's main road, at the bottom of the valley between Seodaemun-gu (West) and Songbuk-gu (East). Right before the Segeomjeong-ro - Jahamun-ro crossroads, Hongjecheon draws an absolutely ravishing curve, with a small village at its tip. Unfortunately, redevelopment has already spoiled an area which would, in any other city, have remained a very picturesque neighborhood. Gracefully, the stream then circles the hill crowned by Hongjimun, Seoul fortress's northern gate, while nesting at its feet the pavillion that gave its name to the road, Segeomjeong. But all you see is the big crossroads, where Jahamun-ro stops, at the entrance of Sangmyung University. Starting at Gyeongbokgung Station, the road that splits Seochon in its middle was widened when the Jahamun Tunnel was pierced, and prolonged here, where it looks more like the beginning of a highway. A hundred meters further to the west, you leave Jongno for Seodaemun. You have now reached the northernmost part of another valley surrounded by a complex mountain system featuring Inwangsan, Bukhansan, Baekryeonsan, Yeonhuisan and Ansan. Here, separating Hongeun-dong and Hongje-dong, Hongjecheon draws another curve, this time much wider and heading north, as if to contemplate the scenery before dashing towards the Han river. If Naebu Expressway mercifully spared this curve (to gain a few costly hectometers), a couple of appartement blocks have been sprayed over the landscape. There used to be more than a few hanoks in the area, but I don't think many survived. Soon after the loop, Naebu rides Hongjecheon's back again. Worse: the stream is fully covered by an older concrete monster, Yujin Sanga (유진상가). The long shopping arcade - or rather the Inwang Market it also hides - marks a strategic crossroads: here, Segeomjeong-ro becomes Yeonhui-ro and meets Tongil-ro, northeast Seoul's historic backbone. You're in Hongje Station neighborhood, an urban question mark subject to countless renovation projects. 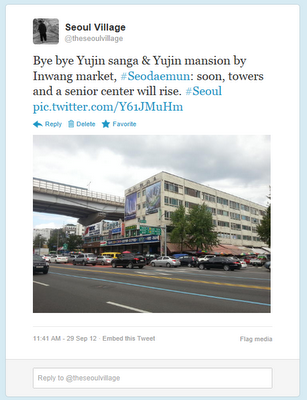 Four years ago, there was a plan to build 50 story towers and a silver center there, and last time I mentioned this spot, it was to wonder about the future of Inwang Market ("Tongin market opens up to art : adaptation or yet another symptom of Seochon's "Bukchonization"?"). Seodaemun-gu just announced 500 residences for students (one site near the subway station, another in front of the Grand Hilton): there are more than a dozen universities nearby, and it could complete a Sinchon-Hongdae-Hongje triangle. Anyway, I don't hear much about the stream in any renovation project. As if it didn't exist. And it precisely happens to be one of the few historic, cultural, and natural threads planners can leverage in the area. Hongjecheon becomes more tourist-friendly when it meets Moraenae-ro: a fake waterfall and a promenade have been arranged in the last curve before the straight line to Hangang, and sport facilities regularly dot the usual bike lanes along the banks. It can't get much kitschier, but it works, and it reconciles whole neigborhoods with the old waterway. Great risks and opportunities rise with Gajwa New Town / Gajaeul New Town growing up on the northern side (Namgajwa-dong / Moraenae-ro), and the smaller redevelopments planned on the southern side (Yeonhui-dong / Hongjecheon-ro). Again, this area "is expecting redeveloppement like Ellen Ripley her baby alien", and I'm not sure such eateries as Moraeae Seollongtang or Yeonhuigol Gumteo will survive. Let's hope Seodaemun-gu and Seoul Metropolitan Government will not allow towers to be erected along the stream the way it did almost everywhere else, clogging the city even more instead of leveraging some of its most precious assets. To the contrary, it's a unique opportunity to improve urban and daily life harmony, and the pedestrian and cultural experience along Hongjecheon. As you follow the current, you walk under the bridges of Hongyeongyo (at Yeonhui-ro), Hongyeon2gyo (at Gajwa-ro), and Hongnamgyo (at Jungga-ro), before reaching another major concrete and steel mess around Sacheongyo, where Hongjaecheon and Naebu Ringways cross a major road (Seongsan-ro/Susaek-ro), and a major railway (the Gyeonghui Line*). At this disgraceful frontier between Seodaemun-gu and Mapo-gu, the stream is a victim among others of urbanism gone wrong. The final stretch now. Before merging with the Han River, Hongjecheon flows east-southeastwards in a sunken straight line, even more overwhelmed by road infrastructures. From above, people riding their bikes or using the free exercise machines almost look like inmates in a high security facility. Between Mapo-gu City Hall and Seoul World Cup Stadium, just a few hundred meters before Hangang, the stream receives a last minute boost from Bulgwancheon, a lucky rival who saw no elevated highway ride piggyback along its path... Which, of course, doesn't mean urban planners will spare it. Anyway. In a final concrete spaghetti extravaganza, Naebu Ringway and Seongsan-ro also rush towards the river, splitting into thinner elevated tentacles plungeing towards the riveside highways, or even reaching across the Hangang, as Seongsan-ro turns into Seongsan Bridge. The general impression? 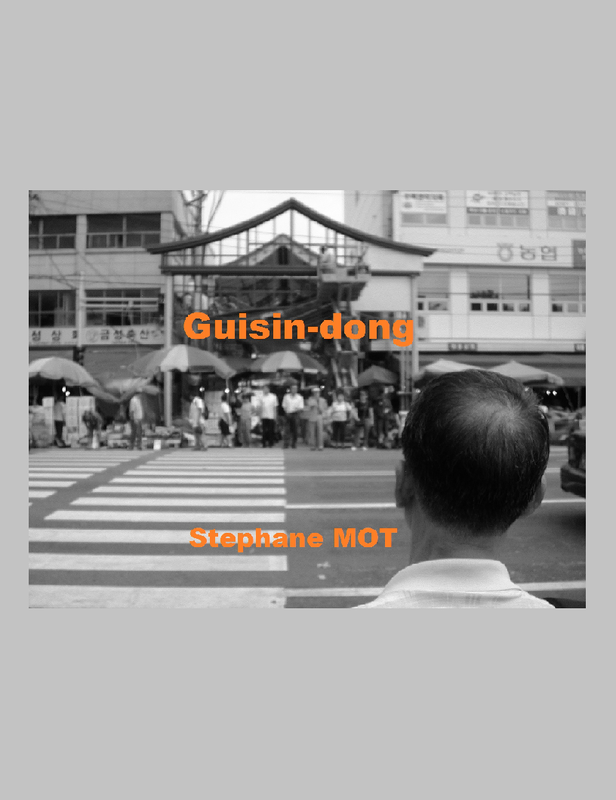 Cars and roads everywhere, the negation of a city, the negation of its citizens, the negation of its natural landscape. I would like to show two films in parallel: the journey we've just made along Hongjecheon, then and now, before and after the urban massacre. My point is not that everything was better in the past (not always true), but that we must work on a better future. Maybe these two films could help trigger a third, animated one: a collaborative effort showing what could be reasonably done to right some of the wrongest wrongs. 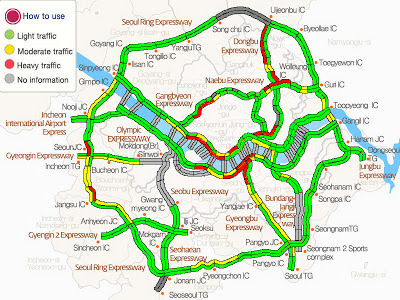 * which by the way will be extended all the way to Gongdeok (inauguration by the end of this year). Am I reading this correctly that they're redeveloping Yujin Sangga? The building is still standing but yes, that's the plan. Projects abound in the vicinity, and smaller projects along Tongil-ro are already changing the cityscape.